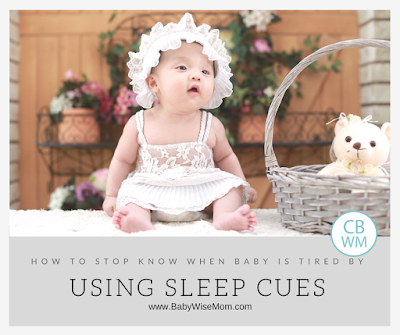 A sleep cue is something your baby does that indicates he/she is tired and ready to go to sleep. If you are lucky, your baby will give you consistent cues to let you know when it is time to go down for a nap. Some babies and moms are so efficient at communicating these cues with each other that there is no need for a clock. For others, the clock/cue combo does wonders. Let me reiterate the importance of getting the waketime length correct. Your baby will sleep much better if you get her down on time. Your baby will also cry least (if you are doing cry it out) if you get down at the right time. Figuring these cues out will really help you get it right. There are several posts on the subject if you need more convincing: see Easy Nap Fix. Fussiness. This was my son’s cue. He’d start to get fussy, I’d look at the clock, and sure enough. It was time for a nap. Yawning. This was my daughter’s nap cue for a while. For her, it was one nap. Some moms have said three yawns. Red around the eyes. My son also had this for a while. Rubbing eyes. My daughter has recently picked this one up. Naughtiness. This is more a cue for older children. My son now will get naughty if he is overdue for sleep. Hard to please. Some babies get impossible to entertain. This would be similar to fussiness, though baby might not be fussy. You do need to combine these cues with the clock. Take your baby’s age into account and also normal naptime. Around 2 months old, Kaitlyn dropped all cues all together until recently (11 months). So I had to go by the clock only. For my kids, naptime is naptime. Their naptimes are at the same time each day. Brayden’s (nearly 3) is the most concrete. Kaitlyn’s can flex a little, but never vary by more than 15 minutes. If you are having a hard time figuring your child’s cues out, a log can be handy to track what you saw and the results of that cue. Good luck! 1. Not totally. Some babies will fuss if they are bored with what is going on or if it is simply too much. But yes, after 12 hours of sleep, she still needs a nap after 1 hour. That will eventually lengthen out, but is totally normal right now.2 hours is most likely too long for her at this age. If it is too early, they usually play. If she is waking after 35 minutes, she most likely needs a shorter waketime. Try 1 hour waketimes and see how it goes. If you need help solving nap problems, get my eBook, The Babywise Mom Nap Guide. 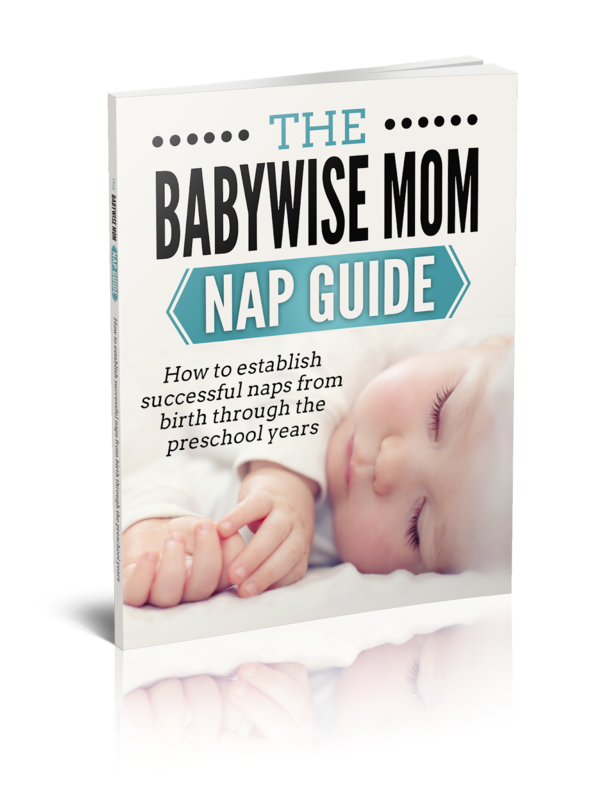 This book helps you establish successful naps from birth through the preschool years. You can buy it here and get an instant download. Funny that I just read this…My son (6 mo.) almost always tells me he’s tired as soon as he gets fussy (usually a waketime of about 1.5 hrs). Towards the end of his playtime I often have him do some independent playtime with a few toys. Then as soon as he gets fussy I know he’s ready for a nap. Sure enough this last waketime he did not get fussy at all. He was having a grand time playing with himself. After a while, when I looked at the clock I realized that he had been up for a little over two hours! I put him right down and he fell asleep pretty quickly (usually when I put him down late he screams), BUT woke up after only 40 minutes. I was fortunate that he fell back asleep after only 5 minutes of crying. 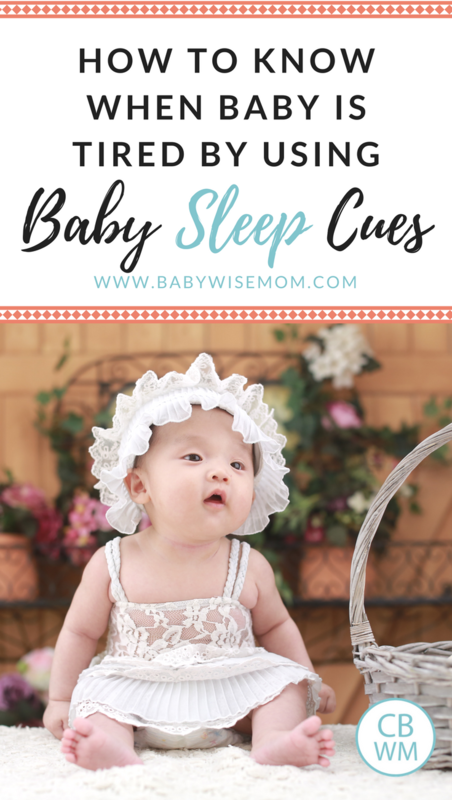 Often, when I put him down late, that 40 minute power nap gives him the stamina to cry for a while and not go back to sleep.Just a little story to emphasize the importance of keeping a close eye on sleep cues AND the clock!Thanks for your blog! I stumbled across your blog and have really appreciated several of your posts – thanks!My 5 month old son usually has waketimes of about 1.5 hours, except in the evening when he may be up 2+ hours before his 7 p.m. bedtime. When he awakes early from a nap and will not go back to sleep, what advice do you have on the following waketime? If I try to keep him up until I would when he has taken a longer nap, he sometimes seems too overtired to fall asleep on his own. However, if I put him down after he has been awake 1.5 hours, the rest of the day is different and I find myself trying to squeeze in another little nap somewhere. Any advice?? He is a really happy baby and so nap cues, like fussiness, sometimes aren’t present. Thank you!~N.F. thanks for posting about naps. It makes me more confident in what I am doing. My son is 3 months and I am breastfeeding him. he gets 4 breastfeedings in the day and his last feeding is a formula bottle between 8:30 and 9. He now takes 6 ounces. He seems to be fine, gaining weight and all. Do you think that it is possible that I could be comprimising my supply? I do pump the feeding that I give him a formula bottle so that I can keep that supply and I freeze that milk. He is getting a total of 5 feedings a day. Is that too little? Doesn’t seem to bother him. Before my son could sit up, he would raise his left arm over his eyebrows when he would get tired. We just thought he was being cute for awhile; but then we figured out that was his cue. My parents were keeping him one night, and said, “he didn’t seem tired yet, but he kept raising his arm over his eyes and it was really cute!” We told them that WAS the cue! Ha! I have encouraged my other mom friends to look for unique clues also instead of just the fussiness. Now our son is 15 months old, and if he is fussy, we say “are you ready to take a nap or go ‘night-night’ and he runs to his room”. For us, usually by the time Ethan gets fussy, he’s overtired. I would definitely look for unique little cues. Ethan will put his head down on our shoulder (if he’s being held) and often babbles quietly (even when not being held). After that he’ll yawn a couple times.. and then he starts to get fussy. Though he’s not as good of a napper as I would like, I do have more success if I get him down at the babbling or yawning stage than the fussy stage. Kate, thanks for the added experience! Noelle,I am glad you have found us! See this post:Waketime When They Wake Early: http://babywisemom.blogspot.com/2007/11/waketime-when-they-wake-early.htmlIt is a hard call on exactly what to do in those situations, but that post has my advice on that.My baby also shows no cues (until recently). You have to just keep track of wake times and then the nap that followed. If the nap was at least 1.5 hours, the waketime was good. If not, keep working on it. Different times of day will have different waketime lengths. It will take time to figure it all out, but you will get it. Good luck! Jessica and Courtney,Thanks for sharing your cues. I will add those to the main body of the post to illustrate your points. Thanks! Some information I have lists 45-75 minutes for a 5 month old. At that age, Kaitlyn did 1 hour. I think Brayden was closer to 2 hours, though I don’t remember for sure. From what I have heard, I would say 1-2 hours is more accurate for a 5 month old. In calculating waketime, consider your schedule and nap length needed. If you are on a 3 hour schedule and baby takes a 2 hour nap, then you have 1 hour waketime. If baby takes 1.5 hour nap, you have 1.5 hour waketime. Even on a 4 hour schedule, the shortest a nap should be is 1.5 hours, and up to 2.5 hours. If baby is a 1.5 hour sleeper, that would give longest of 2.5 hours waketime between wakeup and nap one and also nap one and nap two. If nap three is dropped at the time, then you could have a longer waketime period in the day (up to about 4.5 hours). However, the youngest you drop that third nap is 6 months. Good luck figuring out the right waketime for your baby! Each baby is so different, so take these numbers and consider them, but don’t be concerned if they don’t match up with what your baby really needs. thanks Izzysmamma for your input! Your welcome, although your estimate of 1-2 hours sounds more accurate then the list I gave. I had a question about picking your naptimes w/o sleep ques. How did you decide what time worked? Was it just trial and error? It was a combo a few things:1-knowing how long she should be sleeping (the ranges)2-knowing her sleep type. She is a sleeper, so she has always slept on the longer end of the spectrum.3-then trial and error. Taking the first two into account helped shorten the length of time trial and error went on. But it repeats itself each time she needs to increase her length time. My 5/12 month old usually naps on the shorter end of the length they should be, but we are still on a 3 hr schedule. He is usually awake about 1 – 1/2 hours, except in the late afternoon when his nap is usually a 45min power nap. Hope this helps. Is it possible for the first waketime of the day to go from 30 min. to 1.5 hours in just a couple of weeks? I thought things progressed slower then that. Our first nap was always the best. Now the last couple of weeks she is staying awake in her crib talking and then waking after 45 min. She always seems to fall asleep about 1.5 hours from when she first woke up. I have tried to increase wake times gradually but it is always the same. Im following yawns, but maybe not enough yawns? Needless to say when this first nap doesnt go well the rest of the day is all sorts of fun. 🙂 Has anyone experienced a change this fast? Sounds fast to me. I guess anything is possible, but I would be more inclined to think she is busy working on some skill rather than needing to extend waktime by one hour. She is so excited by whatever it is she is doing she is doing that instead of sleeping, then getting herself overly tired.When you have extended waktime, how large of increments have you done? I have found often Kaitlyn only goes up by 5 minutes at a time. That makes a difference for her. I just wanted to add a comment regarding nap cues. I have had an incredibly difficult time figuring out what cue my baby gives when it is time for naptime. By the time she fussed, it was too late, and there never seemed to be a consistant earlier sign. My mother has been telling me over and over how much my daughter moves and wiggles, and I suddenly realized one day that her sleepy cue was no movement. When she lays still and quietly watches you, and it’s close to what I think naptime should be, then I put her down and naptime is much better. I have also found that sometimes she needs to CIO if she is fussy in the middle of a nap (when she doesn’t pick up her head or open her eyes), othertimes, she needs to get up and play a little before she goes back down for the rest of her nap (this is when she picks her head up and is looking around). So basically I wanted to throw my experiences out there for mom’s who are struggling with naptime, and encourage everyone to keep trying, to keep experimenting and know that you will eventually figure naptime out. Thanks so much! That is very helpful to get the cues of other babys. My son is 26 mo old and since the time change in March, we’ve had trouble w/ him laying down and going right to sleep. He has trouble “turning off” his brain and will play/sing in his crib for 45 min or more if we let him. We’ve tried to minimize excitement w/ stories, songs, etc before bed. We now end up holding/rocking him until he’s really drowsy before he will sucombe to sleep. The rocking usually comes after we’ve put him to bed and told him to go to sleep, then watch him on the baby monitor camera 15-20 min later only to see “baby olympics” going on in his crib! 1)Is there a point that we instill some sort of punishment for disobeying our command to lay down and go to sleep? 2)Do you think we should shorten his nap (12:30-3:30) so he’s more tired by bedtime? (FYI- he goes right down for his nap. )Thanks for any thoughts on this- my back needs the break from all the rocking to sleep! I am transitioning my 5.5 month old to two naps a day and need help. His eating schedule is:- 7 am- 11 am- 2 pm- 5 pm- 7 pmThe first morning nap fits well – from 9:15 am – 11 am – so he wakes up and eats. But the afternoon nap is throwing me for a loop. If I put him down at 1 pm, he only sleeps an hour, not enough to get him through to bedtime at 7 pm.Should I hold him off until 1:30 or 2 and feed him right before he goes down? Help please?!?! mtmommy,I just now saw your post. Are things better now? Do you still need help? Stephanie,Are you sure he is ready for only two naps? Few are ready as early as 6 months. Most are around 8 months. Between 6-8 months, the third turns into a 45 minute nap (or remains that way if it was already). I would try a shorter waketime after 11. Two hours is likely too long for him at that age and that time of day. Once you get that down and nice and long, you can evaluate if he is really ready to drop that 3rd nap totally. Thank you! You’re right, I probably was rushing him into it – I’ll wait it out and continue the third nap until he’s ready. My daughter went to two naps at 6 months but I think this little boy needs more sleep 🙂 Thank you for your wonderful advice. I have a question about trail and error for waketimes. If you try to shorten you LO’s waketime for one of his naps and it doesn’t fix your issue does that mean that wasn’t the solution? Or do you need to keep at for a few naps? In other words, how many trails do you need to do in order to conclude that it did/did not work? I think I need to play with my 12 week old’s waketime. I would give it a few days to try it, then try something else. I think in many cases it will be fixed pretty fast, but you just never know. It is a good idea to give it a few tries before moving on. I have a nap question. My 2 month old little boy is having some issues. We tried your quick nap fix yesterday morning and it worked awesome. He slept for two hours and I had to wake him up from both naps for his feeding. But when I did the exact same thing for his afternoon naps he only slept for 20 minutes and no matter what I did he wouldn’t go back to sleep. Do babies need longer waketime in the afternoon? Do you have any suggestions on how to get him to sleep better and longer, especially for his last nap before bedtime? Sometimes he can soothe himself back to sleep but he doesn’t seem to be able to soothe himself back to sleep, he is just wide awake! It is really messing up his bedtime too because he gets over stimulated. Any help would be awesome! As they get older, they definitely need longer waketimes later in the day than earlier in the day.Also, expect that last nap to only be 30-60 minutes. That is totally normal. I am on the verge of tears the last few days…I need some help with naps. My daughter is 5 months. She takes about a 1 hr nap in the morning after her first feeding and then her naps only last 30 min about 2 other times during the day. She is sleeping great at night (about 10-11hrs).So the last few days I’ve realized part of the problem is me. I need to get her down earlier and be commited to stay home to work this out. She sleeps easily in the car, swing etc. So my big questions are how to extend her naps and how does her waketime fit into trying to get her to sleep/or back to sleep. It takes her 10-20 min to fall asleep. Then right at 30 min she wakes up. I’ve tried today to let her CIO for up to an hour in her crib when she wakes up after the 30 min. But she will not fall back asleep. So then do I count her wake time from when she wakes up after the 30 min nap? Then usually I feed her and it seems like it would be time to nap again…Because she is only napping 30 min she is still on a 3 hr feeding schedule. But with all this, I feel like everything is off. I’ve read everything posted on how to get her to sleep longer..but nothing is working. I have a dark room, sound machine, i follow a routine with her before every nap. I guess I wonder should I just plow through this week putting her down every 1.5 hrs of wake time and letting her cry in her crib up to an hour after a fake nap???? I feel like it is hard to listen to her cry so much, but I am willing to try it if she will learn to sleep longer. HELP! I have a 10 month old and I’m not sure what her schedule should be. Should it be a 4 hour schedule or a 5 hour schedule, a combo, etc? Right now she eats BF at 7am, L at11:30 or 12, dnr at 4:00-5:00pm and night time bottle at 7pm. It seems like she would be fine with just one long nap in the afternoon because if she sleeps in the morning she only sleeps 35-45 minutes in the afternoon (if she sleeps at all) but if she doesn’t sleep well in the morning or not at all then she sleeps 1.5 – 2.5 hours in the afternoon. I can’t get her to sleep 2 good naps of at least 1.5 hours. According to BW she needs two naps until 14-16 months old. Which makes me think I’m doing something wrong with her schedule and her wake time. Can someone give me an example of what their schedule looks like for a 10 month old and how long the feeding intervals should be? I’ve been struggling with this for about a month. I’ve tried shortening and lengthening wake times but I can’t seem to find anything that works. Thanks! Sarah, I apologize, I didn’t know your post was here. Are you still having problems? Thanks for pointing me in the right direction. It looks like I’m giving my daughter too much waketime. I’d like to try your sample schedule, however, now with the time change a few weeks ahead I’m not sure what to do. Right now I am putting the baby down at 9:45 instead of 9:15 like your schedule suggests and 1:45 instead of 1:15. I’ve already succeded at moving waketime from 7am to 7:30am over the course of 2 weeks in preparation of the time change. My daughter is still only taking one long nap a day. She stays awake in her crib the entire length of the nap she skips and she is not consistant on which nap she skips. Sometimes its the morning nap, sometimes its the afternoon nap. Any recommendations given the fact that the time change is near by? Thank you for your time. Hi – I’m a new mom to a 10 day old baby. We were going to try BW, but don’t think we can handle CIO with him being so young. Is there a good post on using BW without CIO? Also, is there a post on suggestions to handle overstimulation once it’s already happened? LoveMommyhood, I am sorry I missed your question until now. Please let me know if you still need help. I am now getting nap cues even after naps. Im confused because when I wake up in the morning, and I wake up from a nap, I yawn, I rub my eyes, all the same cues as Im looking for in baby for sleepiness. So I dont know whether she needs to sleep longer, or whether shes just doing these cues because shes waking up. So sometimes I will put her down 30 min after shes woken up adn she will SCREAM which she rarely does. Then I will get her back up bc I will then assume shes not tired, as she never screams for naps. I am afraid that this habit is going to get her thiking that if she screams mommy will come get her. I am really frustrated bc I can’t tell when shes REALLY tired. Also, when my mother n law was over here, she was able to tell me when baby was feeling PAIN vs being tired (she has reflux), and baby woudl always sleep a full nap. She left and baby’s back to 45 min. Because when shes feeling pain she has some of the same nap cues, like red eyes and rubbing face and fussiness. How did you distinguish between tired and reflux if baby doesn’t yawn? (anymore 🙂 ). She only yawns at night!Any advice would be appreciated. Thanks! I did read the reflux post! Sarah and James,Did you get your issue worked out? If you give me some tips that would be great. Im on the verge of tears also. Ive been dealing with the 45 min naps since she was 2 months old and I feel like its my fault- like Im not noticing something that I should. She fell back asleep for her 1st nap, but for her second she didnt, but I just got her up bc the past few days she will cry for an hour before going back to sleep for 20 min. So I thougth Id get her up this time. Well I did, and she was cranky the whole time. Now shes being cranky about sleeping for her third nap (shes going down earlier bc shes cranky). Screaming etc, which is uncommon unless I keep her up cranky for about 30 min. I dont knwo what to do. KJackson, What age is she?Kaitlyn stopped showing cues really young. I don’t remember exactly when. I think it was around 2-3 months old.If your baby doesn’t show cues, you have to go more by time awake and take other clues to figure out optimal waketime length. See this post:Optimal Waketime Lengths : http://babywisemom.blogspot.com/2008/07/optimal-waketime-lengths.htmlandWaketime: Length, Extending, and Calculating: http://babywisemom.blogspot.com/2008/02/waketime-length-extending-and.htmlI don’t remember how old your baby is, but it seems she is at least four months? 30 minutes of waketime is definitely too short for a baby any older than two months. As far as distinguishing cries…that is something that just comes with time and observation. Keep a log if you need further help on figuring it out. mshave, thanks for sharing your success story! It is always good to hear those. Hi there. I have written to you before in previous blogs. I am having a hard time with my 8 1/2 week olds naps. We have been doing BW since day 1. We put him down awake and he will scream until his next feeding time. Next feeding time he will eat and go right to sleep as he missed his last nap because he was to busy crying through it. I have tried shortening wake time, increasing wake time, changing diapers, giving pacifier, so on and nothing will work. I have tried going in there after an hour and moving him to his bouncer or swing hoping he would get some sleep before the next cycle however he would never go to sleep. I have also tried leaving him in there the whole time. No success. He just eats at the next time and falls asleep immediately after and sleeps until his next feeding time. I am trying so hard to stick with this and have been letting him CIO but this has been going on for 8 1/2 weeks I am starting to feel doubtful that he will get it. I’m wondering if there is anything else that I could try? I need to get him napping more consistently especially before I go back to work and leave him with the sitter and am not sure what to do. I can’t imagine at his age he should be staying awake for one 3 hour cycle and then sleeping for 2.5 hours and then awake for another 3 hour cycle and sleeping for 2.5–should he??? Any advice or suggestions you have for me will be greatly appreciated!!! Thanks so much!! Alison, No, he shouldn’t be staying awake for a cycle then sleeping longer for another.There are a couple of posts I would recommend:CIO Bootcamp: http://babywisemom.blogspot.com/2007/11/cio-bootcamp.htmlUsing Babywise Without Doing CIO : http://babywisemom.blogspot.com/2008/12/using-babywise-without-doing-cio.htmlWaking Early From Naps/Won’t Fall Asleep For Naps: http://babywisemom.blogspot.com/2008/01/waking-early-from-napswont-fall-asleep.htmlCIO Responsibly : http://babywisemom.blogspot.com/2009/01/cio-responsibly.htmlLet me know if you still have questions after reading through those. Thanks so much for this blog….amazing!! My 8 1/2 week old has been having trouble staying asleep for his mid-day nap and his afternoon and evening naps. He will fall asleep and wake up crying within 20-40 minutes of falling asleep. I don't think he is hungry so what should I do? If I choose to let him CIO how do I do this? How do I know when he just simply won't fall asleep? I usually go in after a few minutes of 'whining' and give him his pacifier and he falls asleep for maybe 10 more minutes and then he cries again….do I just need to leave him and not give him his pacifier? Mama Nicole, since he is falling asleep but waking 10 minutes later, I would guess that he is waking for a specific reason other than "can't transition." He might have gas pain ,reflux pain, be hungry…but if he is waking back up after 10 minutes, here is a physical issue going on that you will need to figure out and address. HI! I have an 8 week old, and we just started babywise this week. Although we have not adjusted totally to our new schedule, I find that he is sleepying alot! Alot more than he used too, but I am wondering if it is too much? Each of his naps is about 1:45-2 hours long, on a 3 hour cycle. Does this seem to be consistent with others his same age? Yes, that sounds perfect! Just enjoy it and know that the napping is what is best for his little brain and body right now. I just started my 9 week old today and it was awful. First nap she was so tired (not a morning person)so she barely fussed. Second nap she cried for 30 mins and then only slept for 40 mins. Third nap she cried for 50 mins and slept for 30. For the next two naps she didn't sleep at all and cried the entire time. I check on her and pat her and kiss her every 20 mins. I kept her wake time at 30 mins bc she would start getting fussy. We are doing a feeding every 2 1/2 hours. She was used to breastfeeding to sleep and feeding on demand so maybe shes just pissed shes not getting those things anymore. But I'm in tears and exhausted. Any advice? NMH, that sounds pretty normal for a baby who is used to things one way and gets things switched up–even the short naps. Read over the CIO bootcamp post for lots of guidance on going through it. Things should improve rather quickly. Hi. I'm trying to figure out naps with my 2.5 week old. She does great sleeping at night but not so during the day. I try to get her to sleep walking around in her room but she just cries. If I walk around the house tho she'll fall asleep. But once I out her in her crib, she wakes up and cries. If I stay holding her, she'll sleep forever. Maybe I'm waiting too long to pu her down; she gets fussy an hour and a half after waking so that's when I start. Maybe I should be staring earlier? Amber,Definitely put her down earlier. She should be up less than 60 minutes totally (including feeding). It could be as little as 30-40 minutes. I began having problem with my baby of ten weeks, as she sleeps through all feedings now and it is impossible to keep her awake (tried your suggestions to keep her awake but it only works for a minute). She was on Gina Ford routine (trying to get on it with some flexibility) but now it's all over the chart no routine at all, she sleeps when eating, but eats for fifteen minutes, she sleeps shorter periods at the nap times, may be 30 min or one hour but cries in between, then she wakes up hungry and again eats for fifteen minutes. Even If I succeed to wait out three hours pass before next feeding, she will still eat fifteen minutes and fall asleep.